"If the mind is clean, fate is good - be with us be genuine"
The average size of the countries livestock is about 40,5 million. Annually 11% dies or is slaughtered.In winter animals are extremely fulnerable. There are about 2.3 million horse, 18 million sheep, 17 million goats. A total of about 300.000-350.000 horses die annually and 5 million sheep and little less but also about 5 million goats. Are animals being slaughtered for their skins or are the skins a by-product? The skins are a by product the main value comes from the meat. The skins gain value once turned into leathers. Skins not even provide for 2%-5% of to total value. Horse hairs are on top a by-product of the skins. About 4% of the remaining 25% is exported as wet-blue to Italy next to some export to Turkey, South-Korea and Spain. Finished leathers are mainly produced for the Russian and local market. Most of the leather good factories have to import finished leather to make their end products. In 5 years its being expected that the local tanneries can provide in their demand. In value the leather sector has a potential to grow with about 500%. Currently the leather sector covers 1.1 % of the total export capital in Mongolia. What is the situation with animal welfare in Mongolia? The leather is made from hides from livestock owned by Mongolian herders. These animals have grazed freely in the Mongolian highlands following ancient traditions. They eat the grasses and herbs on the highlands and in this way maintain the natural landscape. For slaughter, the herder selects his weakest animals, those animals who are not expected to make it through the harsh winters, and those animals that have not provided any offspring for several seasons. The slaughtering process primarily serves as a way to keep up with the meat consumption and to keep the livestock balanced and healthy. The animals are never slaughtered for their hides. Because of this the means of slaughtering, health of the animals and quality of the hides can be influenced. The animals feed on grasses and herbs from the green valley (and not with artificial food or corn). Unique to the situation in Mongolia is that the animals do not need to be transported from farm to slaughterhouse. Transport is one of the aspects that many animal welfare organizations pay attention to. 95% of the animals are slaughtered by the herder and their family and approximately 5% is slaughtered in a slaughterhouse. Mongolian herders use a knife and no sedatives for their traditional methods. In 2013 the government introduced a policy that restricts the export of raw skins stimulating local processing and investments in technology. Majority of the tanning proces is chrome tanned like in the rest of the world. Tannerys prove to be more and more interested various other technologies that are more water and electricity efficient. Recently the technology to tann Horse hides otherwise left untanned was introduced to several tanneris. We heard about the new label ADUU MAL. What is ADUU MAL about? MiM Genuine Mongolia, STAHL, CSR The Nederlands and various fashion brand from the leather and fashion sector initiated ADUU MAL as a sustainable label with leather from Mongolia. With this label, the companies aim to provide consumers with sustainable leather products with a transparent production process. Jackets, bags, shoes, and leather accessories equipped with the Mongolian sustainable label will be available in the Netherlands during the first half of 2015. What are the goals of ADUU MAL? Providing consumers with sustainable leather products whereof the origins and production conditions are transparent. Establishing a sustainable and transparent supply chain between Europe and Mongolia; aiming at high quality, respect for humans and animals, conservation of nature, and economic advantages for both countries. Further developing the sustainability of leather clothing and accessories from Mongolia, where necessary: from herder to tannery to workshop. Proving to other companies in the leather sector that leather produced with respect for humans, animals, and nature is not only profitable but also technologically achievable. 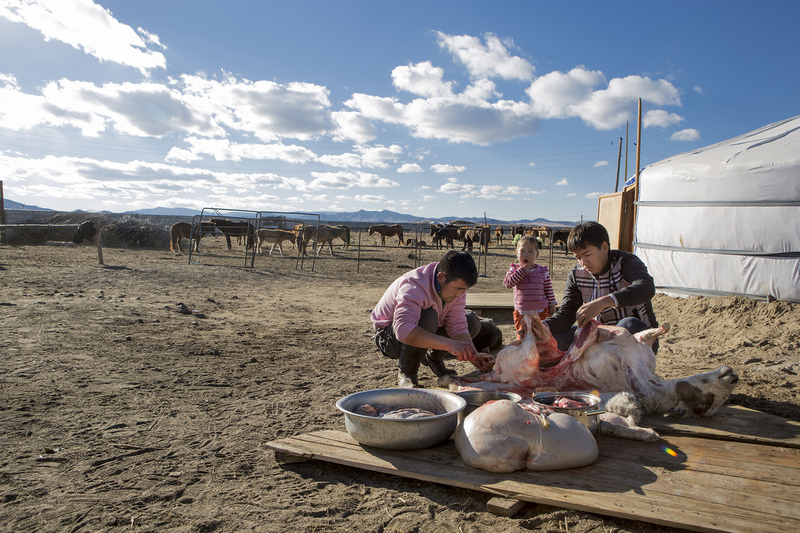 Mongolian livestock lives freely without any limitations imposed by fences or cages. The animals are primarily kept for the following reasons: to graze the land; for their hair, to make stringed instruments and Kashmir, meat and milk; and as a working animal and a transportation mode (horses). Currently, only 10% of the hides are tanned. The quality of Mongolian hides is exceptionally good. Due to the land climate in which the animals live, the hides have a tough structure. The quality of Mongolian hides is exceptionally good. Due to the continental climate in which the animals live, the hides have a tough structure. Moreover, the hides show few damages from insect bites or clashes with barbed wire. The hides from Mongolian sheep are also relatively large. All the hides originate from animals that have not lived in bio industry-like conditions, but have grazed freely on the Mongolian highlands. Preventative use of antibiotics rarely occurs in Mongolia. There is a surplus of horsehides in Mongolia. Thus, there will be no additional stock-breeding and thus no further environmental impact necessary for the processing of these hides. Mongolian tanneries are currently investing a lot of money in machinery and expertise, which will help them produce in the most sustainable manner. The local government is supportive of this development. Still why Mongolian leather? A lengthy transport makes the product less ecofriendly. The leather industry is severely globalised. As opposed to several decades ago, there are few active tanners in the Netherlands. In the production of leather and leather goods, transport has an important but relatively small impact on the environment. The more important factors are good animal welfare, with no deforestation necessary, and the application of sustainable production methods (such as good water management, energy efficiency and use of water-based chemicals). What are the advantages of the project for Mongolian tanneries? It supports tanners to develop with a clear perspective of customer demands and EU standards. With support of MiM and Stahl technical support is organized in order to make the production process more sustainable and improve the quality of the product. ADUU MAL brings along new export markets, which allows them to sell certified sustainable leather to customers around the world. I represent a fashion brand that also wants to create products with the sustainability label. Is that possible? We with our partners of ADUU MAL are there to connect fashion brands that want to sell leather clothing, accessories or other products made from sustainable Mongolian leather with certified Mongolian tanneries and organize with the brands a transparant production chain. In this way, we aim to stimulate a sustainable production of leather products and supply costumers with a recognizable and transparent product. I represent a tannery / leather good producer and want to participate as partner in ADUU MAL. Is that possible ? Certainly its possible and we appreciate you interest and trust in the label. Is the hair for violin bows taken from living horses ? Traditionally herder used hairs of the tails for their music instrument for horse that were alived. Its still prefered to pull out a small bundle to let them as strings on their nomad fiddle sing. More often the hairs for bow instrument are from horses that died. On global scale its hard to know exactly were the hairs were collected and traded. Is the horse being killed for its hair ? No the horses are never killed for their manes of horse tails. Mongolian herders carefully select which animal they expect not to be strong enough to survice the winter or provide for other offsprings. Why should we buy Mongolian horse hair? On global scale its hard to know the exact originig of the hairs. The hairs processed in Mongolia can be traced. Do you use chemicals in cleaning the hairs ? Is it possible to color the hairs ? Its certainly possible. Its not kept in stock and only colored on demand. Do you bleech the hairs ? In principle hairs are not bleeched. Specially care is taken to keep the natural characteristics of the hairs. Do you stretch the hairs ?